Airway epithelial cells and immune cells participate in the inflammatory process responsible for much of the pathology found in the lung of patients with cystic fibrosis (CF). Intense bronchial neutrophilic inflammation and release of proteases and oxygen radicals perpetuate the vicious cycle and progressively damage the airways. In vitro studies suggest that CF transmembrane conductance regulator (CFTR)-deficient airway epithelial cells display signalling abnormalities and aberrant intracellular processes which lead to transcription of inflammatory mediators. Several transcription factors, especially nuclear factor-κB, are activated. In addition, the accumulation of abnormally processed CFTR in the endoplasmic reticulum results in unfolded protein responses that trigger ‘cell stress’ and apoptosis leading to dysregulation of the epithelial cells and innate immune function in the lung, resulting in exaggerated and ineffective airway inflammation. Measuring airway inflammation is crucial for initiating treatment and monitoring its effect. No inflammatory biomarker predictive for the clinical course of CF lung disease is currently known, although neutrophil elastase seems to correlate with lung function decline. CF animal models mimicking human lung disease may provide an important insight into the pathogenesis of lung inflammation in CF and identify new therapeutic targets. There is accumulating evidence, mainly from in vitro studies, suggesting that CFTR dysfunction may directly affect airway immunity through increased production of proinflammatory mediators and impaired immune responses to pathogens. These studies suggest that CFTR-related dysregulation of respiratory epithelial cells and innate immune dysfunction in the lung leads to an exaggerated and ineffective airway inflammation which fails to eradicate pulmonary pathogens.1 This review provides a summary of newer insights into the development of the inflammatory process in CF and its relationship with the irreversible and progressive damage to the lungs of patients with CF. 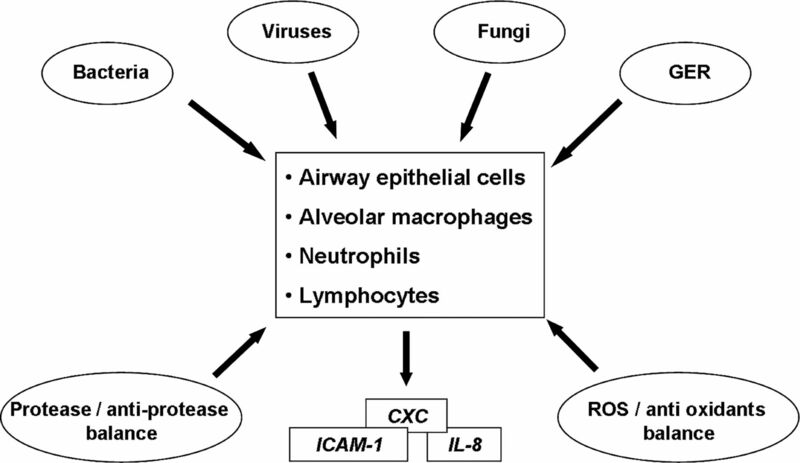 CF-airway cells are exposed to extracellular stimuli, such as infectious organisms, gastric acid, proteases and oxygen radicals which constantly incite an inflammatory response (figure 1). Extracellular triggers of inflammation in cystic fibrosis (CF) airway cells. Various extracellular factors chronically present in CF airways continuously trigger the airway epithelial innate and adaptive immune cells to produce excessive proinflammatory cytokines. To understand the relationship between infection and inflammation in the CF lung, the methods used to detect microbial pathogens need to be considered. Culture-independent methods for quantitative profiling of bacterial populations have opened a new era of investigation. While routine clinical and antibiotic therapies are largely directed by cultures, more sophisticated high-throughput molecular analysis techniques detect much higher bacterial diversity and complex fungal communities in the CF lung.7 However, the clinical significance of the lung microbiota is difficult to interpret. Data derived from primary murine tracheal cells suggest that, following P aeruginosa infection, inflammatory mediators are concentrated in the thin dehydrated periciliary fluid layer of CF airway epithelial cells resulting in high chemokine concentration gradients across the epithelium and an exaggerated inflammatory response.S11 In patients with CF, higher ratios of neutrophils or IL-8 to bacteriaS12 and reduced concentrations of the anti-inflammatory factor IL-10S13 were also found in BAL fluid compared with control subjects regardless of the pathogen recovered. The polymicrobial nature of airway infection including facultative anaerobic bacterial species in patients with CF may further exacerbate the inflammatory response, and inflammatory markers in BAL fluid increase with greater bacterial diversity.9 S14 However, the clinical significance of these bacteria in the progression of chronic pulmonary disease and during exacerbations in CF is yet to be determined. Respiratory viral infections such as respiratory syncytial virus, influenza, parainfluenza, rhinovirus and adenovirus are deleterious to patients with CF leading to greater hospitalisation rates, growth impairment and reduction of lung function. Rhinovirus is a major contributor to pulmonary exacerbations in CF independent of bacterial infections.S15 Viral infections appear to predispose the CF airway to bacterial infection and correlate with earlier acquisition of P aeruginosa.S15 In addition, viral communities may contribute to CF pathology, altering the antibiotic resistance of resident microbes by transferring antibiotic resistance genes through phages.S16 Studies of CF airway epithelial cells have shown that planktonic bacteria from biofilm of mucoid Pseudomonas were released following rhinovirus infection, triggering a more robust inflammatory response, reduced apoptosis and increased viral replication.10 Thus, viruses contribute to airway inflammation in CF by directly infecting the airway and changing the antibiotic resistance patterns of bacterial flora which incite a greater inflammatory response. Severe gastro-oesophageal reflux and pulmonary microaspiration into the lung have been associated with chronic respiratory symptoms such as cough and wheeze and declining lung function in patients with CF.S16 Subjects with CF who had high levels of pepsin in BAL fluid or bile acids in sputum samples had higher IL-8 and NE concentrations,12 suggesting that aspiration of gastric contents is associated with more prominent airway inflammation. Animal studies have shown that repeated aspiration of acid into the tracheobronchial tree resulted in inflammatory cell infiltration to the airway and increased adherence of P aeruginosa to the airway epithelium.S20 S21 Gastro-oesophageal reflux has therefore been proposed as a precipitant for early inflammation in infants with CF, but this association still lacks hard evidence. Intracellular triggers of inflammation in cystic fibrosis (CF) airway cells. Inherent abnormal intracellular pathways, primarily in airway epithelial cells, lead to apoptosis on the one hand and to cell stress and excessive cytokine production on the other, perpetuating the inflammatory response in the airways. CFTR, CF transmembrane conductance regulator; TLR, Toll-like receptor; UPR, unfolded protein response. The response to accumulation of misfolded or unfolded proteins is another feature of the intrinsic proinflammatory CF phenotype. In eukaryotic cells, endoplasmic reticulum (ER) stress arises from the accumulation of misfolded or unfolded proteins in the ER, eliciting the unfolded protein response (UPR), an adaptive signalling pathway designed to resolve ER stress. UPR leads to a reduction of protein synthesis. When UPR signalling pathways are not sufficient to restore normal cell parameters, cells may activate the ER overload response leading to apoptosis.16 To repair tissue damage caused by ER stress-induced cell death, UPR mounts an inflammatory response. Genetic factors that determine the threshold of tolerable ER stress within the epithelium include genes that are centrally involved in the UPR, including X-box binding protein-1, anterior gradient protein-2 and orosomucoid-1-like 3.17 When ΔF508-CFTR is incorrectly folded and stuck in the ER, it induces UPR.S30 Retention of misfolded ΔF508-CFTR triggers ER stress and increases inflammatory signalling by endogenous activation of NF-κB.18 In addition, several inflammatory cytokines that stimulate apoptosis are induced by UPR. However, while this phenomenon may account for a robust inflammatory response in class II CFTR mutations, it does not explain inflammation associated with other CFTR mutations. Measuring airway inflammation in CF is important for initiating anti-inflammatory treatment and monitoring its effect (table 1). At present, no inflammatory biomarker has been consistently shown to predict clinical efficacy. Forced expiratory volume in one second (FEV1), a surrogate to assess severity of CF lung disease, has become the gold standard for monitoring disease progression. In some but not all studies, FEV1 inversely correlated with total cell count and free NE in BAL fluid obtained from patients with CF.2 Due to improved CF care in recent decades, the decline in FEV1 has slowed, reducing its impact as a disease predictor. Thus, prolonged follow-up may be required before an effect of anti-inflammatory therapy can be detected, further limiting the value of FEV1 as an indirect surrogate marker for inflammation in CF. Ventilation inhomogeneity, measured by multiple breath washout and expressed as the lung clearance index (LCI), has emerged as a valuable tool for measuring small airway function in patients with CF with normal or mildly reduced FEV1. LCI was associated with structural abnormalities in the small airways and with inflammatory markers such as IL-8 and neutrophil count in BAL fluid, and was recently used as a clinical trial endpoint for patients with CF with mild pulmonary involvement.24 S36 Nevertheless, large longitudinal studies are still needed to verify its prognostic value. Endobronchial biopsy can detect early pathological changes in the CF lung. Airway remodelling, defined as structural airway wall changes, begins early in life in CF. An increased basement membrane thickness that correlated with BAL fluid concentrations of transforming growth factor-α1 was demonstrated in children with CF.25 In adults with advanced CF disease this approach revealed epithelial squamous metaplasia, loss of ciliated epithelial cells and ultrastructural abnormalities such as disorganisation of tight junctions and compound cilia. More recently, accumulation of lymphocytes was shown in bronchial mucosa, in contrast to neutrophil-dominated inflammation present in the airway lumen.26 Although endobronchial biopsies have been advocated as a tool to evaluate airway inflammation and remodelling in CF,27 S38 this procedure is highly invasive and cannot be used routinely to monitor airway inflammation. High-resolution CT (HRCT) of the chest can show structural changes that indirectly reflect the degree of inflammation in the CF lung, correlating with levels of sputum inflammatory markers such as IL-8 and TNFα.S39 However, these changes may be the result of past airway injury and do not directly reflect active inflammation. Thus, its role as a surrogate outcome measure for clinical trials evaluating the efficacy of anti-inflammatory drugs is still unclear. Furthermore, despite new low-radiation protocols, its safety and applicability for regular monitoring are still major concerns. Finally, an innovative outcome measure is positron emission tomography (PET) using 18fluordeoxyglucose (18FDG PET) which exploits the rapid uptake of 18FDG into neutrophils by metabolic trapping. The 18FDG PET signal was shown to correlate with neutrophilic inflammationS42 and could be used to determine the location and intensity of 18FDG uptake in the lungs. Current technology allows for simultaneous CT imaging for anatomical localisation of PET signals.30 S42 Cross-sectional data from adults with CF have shown that 18FDG uptake correlates with BAL fluid neutrophil counts and can detect an effect of intravenous antibiotic therapy for a pulmonary exacerbation in CF.30S42 Despite these promising results, radiation is a concern which restricts its routine use for clinical indications. Inflammation develops in CF airways early in life in response to extracellular infectious stimuli and possibly due to immune dysregulation which includes abnormal TLR signalling, unfolded CFTR stress response and abnormal innate and adaptive immunity. The failure of the immune response to eradicate infectious organisms from CF airways has received much attention in recent years, but the self-perpetuating inflammatory response accounts for much of the lung pathology seen in patients. Newer animal models which mimic human CF lung disease and other technologies may improve our understanding of lung inflammation in CF and help in the development of new therapies in future years. In the meantime, better methods to measure inflammation in the CF airways need to be developed, which are crucial for treatment with and monitoring of anti-inflammatory agents.
. Neutrophil cell death, activation and bacterial infection in cystic fibrosis. Thorax 2005;60:659–64.
. Infection, inflammation, and lung function decline in infants with cystic fibrosis. Am J Respir Crit Care Med 2011;184:75–81.
. Evolution of pulmonary inflammation and nutritional status in infants and young children with cystic fibrosis. Thorax 2011;66:408–13.
. Sputum biomarkers of inflammation and lung function decline in children with cystic fibrosis. Am J Respir Crit Care Med 2012;186:857–65.
. Airway inflammation in cystic fibrosis. Chest 2008;133:489–95.
. Interleukin-8 production by cystic fibrosis nasal epithelial cells after tumor necrosis factor-alpha and respiratory syncytial virus stimulation. Am J Respir Cell Mol Biol 1998;19:210–5.
. The airway microbiota in cystic fibrosis: a complex fungal and bacterial community–implications for therapeutic management. PLoS ONE 2012;7:e36313.
. Excessive inflammatory response of cystic fibrosis mice to bronchopulmonary infection with Pseudomonas aeruginosa. J Clin Invest 1997;100:2810–15.
. Anaerobic bacteria in cystic fibrosis: pathogens or harmless commensals? Thorax 2011;66:558–9.
. Rhinovirus infection liberates planktonic bacteria from biofilm and increases chemokine responses in cystic fibrosis airway epithelial cells. Thorax 2011;66:333–9.
. Cystic fibrosis transmembrane conductance regulator regulates epithelial cell response to Aspergillus and resultant pulmonary inflammation. Am J Respir Crit Care Med 2012;185:301–10.
. High concentrations of pepsin in bronchoalveolar lavage fluid from children with cystic fibrosis are associated with high interleukin-8 concentrations. Thorax 2011;66:140–3.
. Redox regulation of pro-inflammatory cytokines and IkappaB-alpha/NF-kappaB nuclear translocation and activation. Biochem Biophys Res Commun 2002;296:847–56.
. Cytokine secretion by cystic fibrosis airway epithelial cells. Am J Respir Crit Care Med 2004;169:645–53.
. Ceramide is increased in the lower airway epithelium of people with advanced cystic fibrosis lung disease. 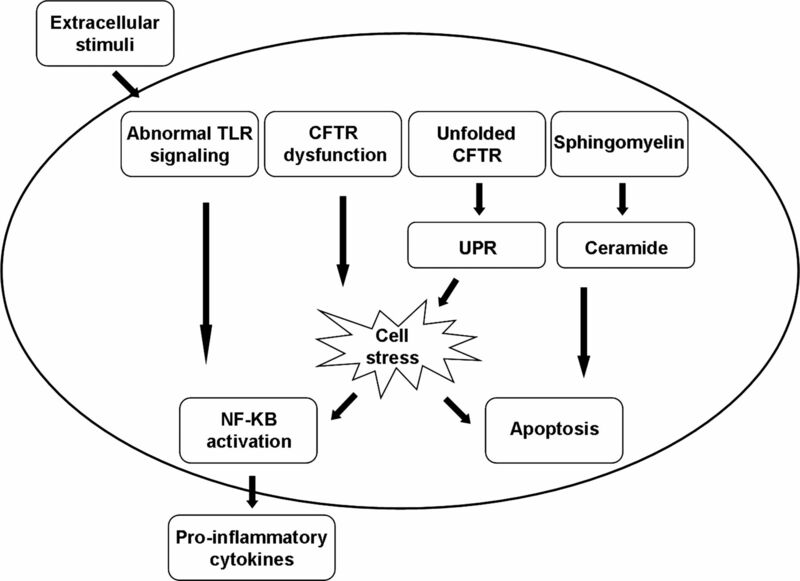 Am J Respir Crit Care Med 2010;182:369–75.
. Endoplasmic reticulum stress: signaling the unfolded protein response. Physiology (Bethesda) 2007;22:193–201.
. Airway epithelial inflammation-induced endoplasmic reticulum Ca2+ store expansion is mediated by X-box binding protein-1. J Biol Chem 2009;284:14904–13.
. Activation of NF-kappaB in airway epithelial cells is dependent on CFTR trafficking and Cl-channel function. Am J Physiol Lung Cell Mol Physiol 2001;281:L71–8.
. Reduced airway surface pH impairs bacterial killing in the porcine cystic fibrosis lung. Nature 2012;487:109–13.
. Alveolar macrophages and CC chemokines are increased in children with cystic fibrosis. Eur Respir J 2009;34:655–61.
. Circulating and airway neutrophils in cystic fibrosis display different TLR expression and responsiveness to interleukin-10. Cytokine 2008;41:54–60.
. Dysregulation of IL-2 and IL-8 production in circulating T lymphocytes from young cystic fibrosis patients. Clin Exp Immunol 2004;135:528–34.
. The Th17 pathway in cystic fibrosis lung disease. Am J Respir Crit Care Med 2011;184:252–8.
. Early cystic fibrosis lung disease detected by bronchoalveolar lavage and lung clearance index. Am J Respir Crit Care Med 2012;185:862–73.
. Airway remodelling in children with cystic fibrosis. Thorax 2007;62:1074–80.
. Distinct patterns of inflammation in the airway lumen and bronchial mucosa of children with cystic fibrosis. Thorax 2012;67:164–70.
. Airway remodelling and its relationship to inflammation in cystic fibrosis. Thorax 2011;66:624–9.
. Breath condensate pH in children with cystic fibrosis and asthma: a new noninvasive marker of airway inflammation? Chest 2004;125:2005–10.
. Hydrogen peroxide and nitric oxide in exhaled air of children with cystic fibrosis during antibiotic treatment. Eur Respir J 2000;16:95–100.
. 18F-fluorodeoxyglucose-PET/CT imaging of lungs in patients with cystic fibrosis. Chest 2009;136:1220–8.
. Disruption of the CFTR gene produces a model of cystic fibrosis in newborn pigs. Science 2008;321:1837–41.
. Genome-wide association and linkage identify modifier loci of lung disease severity in cystic fibrosis at 11p13 and 20q13.2. Nat Genet 2011;43:539–46.
. Generation of multipotent lung and airway progenitors from mouse ESCs and patient-specific cystic fibrosis iPSCs. Cell Stem Cell 2012;10:385–97.
. Directed differentiation of human pluripotent stem cells into mature airway epithelia expressing functional CFTRTR protein. Nat Biotechnol 2012;30:876–82. Contributors MC-C and AE made substantial contributions to the conception and design of the study and drafting of the article. EK and TF revised the article critically for important intellectual content. MC-C, EK, TF and AE approved the final version to be published.